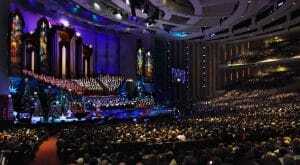 Celebrate the holidays with Christmas with the Mormon Tabernacle Choir. This annual spectacular, the top-viewed holiday program on PBS for 12 years, will feature world-renowned operatic tenor Rolando Villazón as guest artist and narrator. 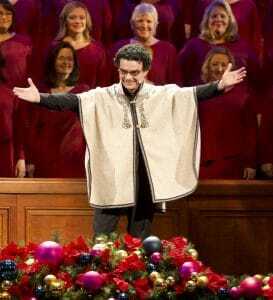 Villazón is the first Latino guest artist to be featured on Christmas with the Mormon Tabernacle Choir. This year’s show weaves beloved Latin-American Christmas carols with traditional holiday favorites to deliver a poignant cross-cultural holiday celebration. Christmas with the Mormon Tabernacle Choir unites a 600-person-strong cast comprised of the 360-voice world-renowned choir, 150-piece orchestra, bell-ringers, dancers, and actors to deliver an unforgettable program of music, pageantry, and storytelling. This year’s program will include holiday carols in both English and Spanish, including “Deck the Hall,” “Carol of the Drum,” “I Saw Three Ships,” “Angels from the Realms of Glory,” “Parade of the Wooden Soldiers,” “Campana Sobre Campana,” and others. Rolando Villazón also provides narration both for the Christmas Story as recorded in Luke 2 of the Bible, and a new retelling of the classic Hans Christian Andersen story “The Little Match Girl,” complete with a live-action performance. On CPTV: Friday, December 15, 2017 at 10 p.m.